ScottyP: Very little happens aside from the action at the end. I understand the need to world-build but things meandered a little. This is absolutely "part of a whole" and doesn't work great as a standalone - but I can also understand a perceived wisdom in repeating some expository beats in a second issue since you never know if the first issue is going to sell out and do so big time. The actual plotting is slow-burn but at least a few things happen that lay a foundation for presumable future events, so that's another positive spun out of the plain truth of the matter which is that it's a slow issue. I reserve the right to appeciate this much more in hindsight once more development occurs. D-Maximal_Primal: After having the introduction to the new Cybertron here in issue 1, issue 2 felt like a slow burning fuse. Nothing too much happens, we get some more introductions, some new cameos, some new life forms, but not much in the way of actual story. Of course it is just the beginning, but 2 issues in, I wish a little bit more would happen. It definitely feels like part 2 of a larger story arc, which is fine, but I wish we had got some more individuality to the issue. ScottyP: Prowl shows up quick and makes a big impact, though I can't decide if that's because he's actually compelling or if he just seems that way because so many of the bots around him are stiff and homogeneous, personality-wise. Regardless, it seems Ruckley knows who Prowl is and is able to show that to us. While familiar, he does convey a sense of Autobot heroism that carries shades of the original G1 incarnation as well as some of the qualities Furman gave to him in Infiltration. I have no idea what Megatron is so mad about. He's telling me he's mad and speaking eloquently about how mad he is and how he wants things to change, but there is nothing to show me why the Ascenticons are so upset. Sure, there's the ending of the issue, but before that, what led them here? Answers are going to be needed soon for this part of the story to be compelling. It's fun to read but lacks the depth required for it to be anything beyond hyper-transitory entertainment. D-Maximal_Primal: Character wise, I feel like Prowl really carried the issue. Right off the bat, we get a Prowl that definitely has some aspects of his prickly previous IDW self, but nothing indicating he has that same sense of morality as the previous Prowl. He has some more heroic stuff mixed in with his snarkasm and know-it-all personality. Wheeljack could have been done a smidge better, but I think the awkward way he was introduced and spoke and interacted with Rubble and Bumblebee was on purpose. It will take some getting used to, but it wasn't bad at all! He felt more like a nerdy engineer rather than the known greatest engineer that is so good he can spin a whole tale telling you how good he could do it. Megatron and the Ascenticons, eh, I want to know more. They feel angry and upset over something that they are not showing us yet, and I wish we could get more in depth. The movement needs some depth. The "multiple factions" need some depth. I think that is the thing the book is lacking so far: some more depth. ScottyP: Hernandez is an enigma. At times it's so good but there are other times where it looks like it was done hastily. I can appreciate the sentiment and need for speed on a fortnightly schedule, but there are panels where no one's in focus that cover 1/2 of a page. Is it too much to ask that at least the characters speaking keep some detail? It makes them seem secondary to just getting their lines out to move things along. On the positive side of Hernandez's pages, the scenery is fantastic and when the characters are done well they really shine. Lafuente's colors continue to allow the lines of Cybertron to be brought to life spectacularly with the lighting effects worth of a second mention. The tones used on the murder victim also help create a welcome contrast. Bumblebee's head and face design also has some distinct characteristics to it that really help this iteration stand out. Whitman draws Transformers the way I want them to look. The last four pages of the book are handled by her, again on the Megatron-focused scenes as was done in issue 1. Adding Burcham's colors to these lines makes for some really outstanding closing pages that helps the issue end on a strong note. D-Maximal_Primal: Between the 2 artists on issue, the final 4 pages with Whitman were my favorite. They really remind me of some Casey Coller work, and they are nice, crisp, clean, and straight. Nothing feels out of proportion, everything feels tight and where it should be, and the facial expressions are really cool. Burcham's colors round out the art nicely there. Hernandez seems to have pages that were prioritized over others, with some characters and pages seemingly getting some more attention than others. Some pages are great! The scene with the Moon and Bumblebee and Rubble watching it were great! 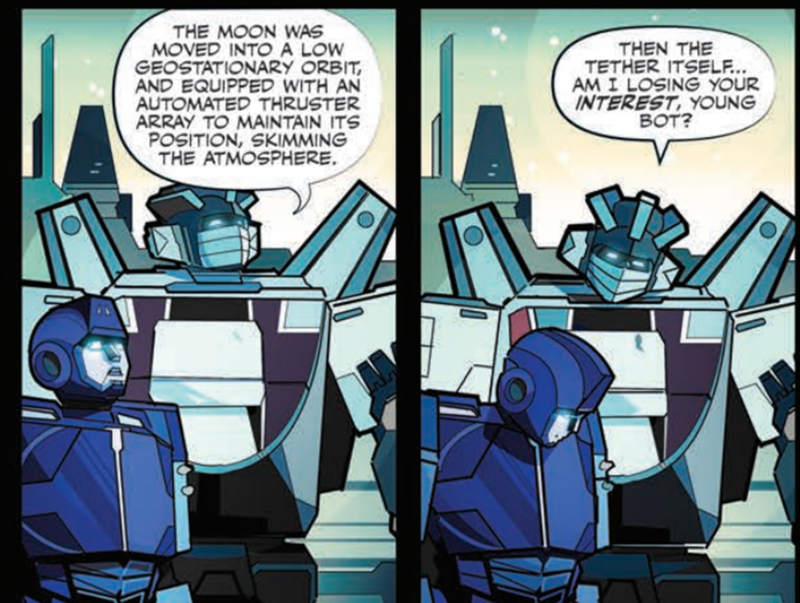 But other scenes, like the opening few pages with Prowl and Chromia feel almost completely different. Even looking at Chromia and Prowl side-by-side, the 2 appear pretty different. There is some great art in the Hernandez sections, but I wish it had some more consistency. ScottyP: This isn't bad and it should be stressed that it's only the second issue so too harsh of a judgment seems both premature and slightly unfair. There are many great pieces here that make me want to continue reading the series, and as part of a longer form work this probably won't stand out as particularly problematic. As a standalone issue there are too many things bugging me to heap universal catch-all praise onto this one. This is a piece of a long-form serial work that serves its purpose as such and features some creative world-building and nice art along the way, but hasn't revealed its niche as a Transformers story at this early stage. D-Maximal_Primal: While the first issue of a series is responsible for setting up your story and grabbing your attention, the second issue has the hardest job of all by having to follow up on that attention grabbing hook. And to that end, the book succeeds in some areas, though not quite all of them. It does its job as a stepping stone in the story, but it doesn't move the story as much as I would hope. I'm hoping that we get some more material, some more story, in the next issue to help pick up and settle into a nice pace for the story. One character transforms in this issue, and it's someone making a (presumably, for now) background cameo appearance. This is despite obvious places where that would/could happen. It was puzzling. Throwing transformations in for the sake of it just to have it is no good, but this misses extremely obvious opportunities for it. ScottyP wrote: One character transforms in this issue, and it's someone making a (presumably, for now) background cameo appearance. This is despite obvious places where that would/could happen. It was puzzling. Throwing transformations in for the sake of it just to have it is no good, but this misses extremely obvious opportunities for it. In the thread for the issue 1 review I said that Megatron's debut and his agenda should have been kept until this issue, and this is why. It would have provided a major moment in this issue, instead of cramming so much into the first issue, and now this issue seems slow by comparison. Keeping Megatron until now would have evened things out a bit and made the pacing more steady, and it would have allowed for Rubble to get a little more established. In any event, I'm looking forward to issue 3. I've enjoyed the first two issues overall. That said, there are some questions and concerns I have with the arrangements and relationships between some of the characters. So far, in both issues, everybody seems to know everybody to some degree, amongst the "known" Autobot characters. This suggests they're all in some capacity working for the same "agency." 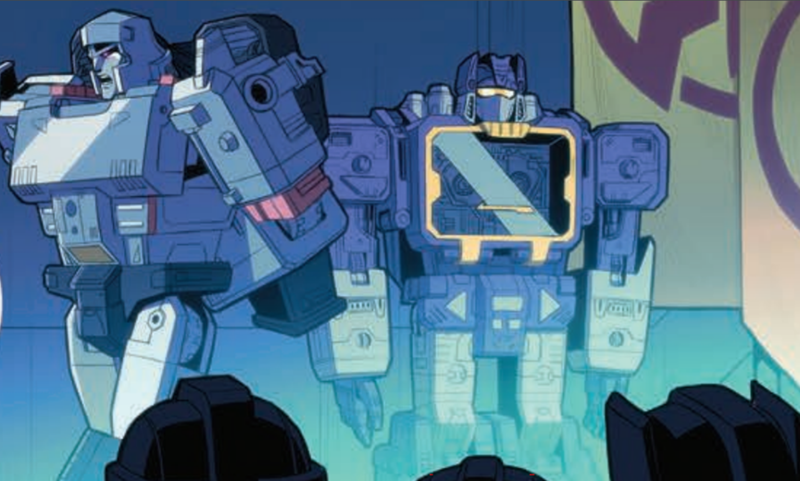 We still don't know exactly what that means, as we know there's a Senate to which Orion Pax and Megatron both belong - and Security Operations - to which all the other Autobots seem to at least have a more than passing relationship with - including Orion. Orion knows every "Autobot" on a personal level, but he's supposedly a Senator - sitting based on the context of the story. What role does a Senator have that is so cozy with Security Operations? A longstanding G1 trope is that Ironhide is Prime's bodyguard, so that tracks, but they both know Prowl who is "the best investigator." I'm not pointing these out as flaws, it's just curious in a move going back to the beginning of the war and including Megatron into Pax's personal relationships. How well do the other characters know him? They most probably have to if he and Orion know each other "better than anyone" I would think. Megatron himself being a Senator is fine, but the buddies with Prime thing bothers me just a bit, especially not yet knowing what his angle is. I seriously hope they don't "dirty up" the Autobots with both-sidesism, mainly because we JUST GOT DONE WITH THAT. The Megatron-wants-to-tear-down-the-system thing goes all the way back to Transformers #1, but I prefer him to be a malefactor, not just a misunderstood guy who made a bad turn along the way. Again, we just had that. 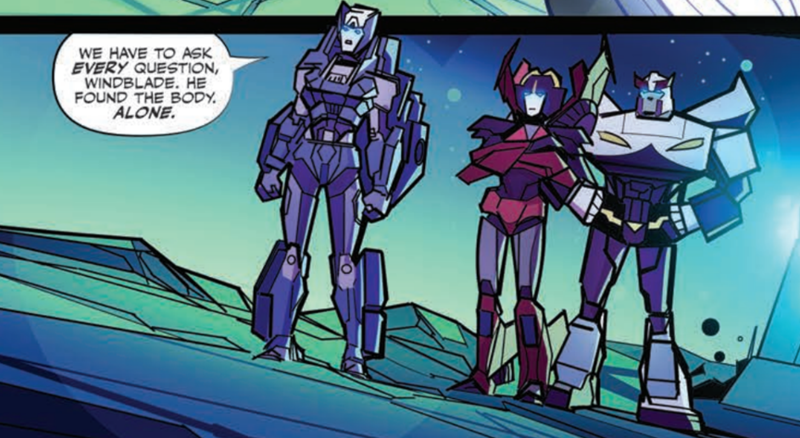 Chromia being "da boss" over Prowl because Prowl isn't concerned with people's feelings thing I liked, but Chromia is probably more unconcerned than he is, based on her comments about REDACTED's death, so I don't know what that really means. Speaking of REDACTED, was it really necessary to kill off a character that could technically get a figure made at some point? Ask yourself: Could they have killed anyone else to make this part of the story work without changing the impact of the event? I did, and I don't think they had to pick anyone to fill that role. They could have said, we're going to see RODNEY DANGERFIELD at the pumping station and find out RODNEY DANGERFIELD is dead and it wouldn't have made a lick of difference to the overall narrative. The Rubble/Bumblebee dynamic is kind of cool. It gives us some information, as limited as it is. This version of Transformers seems to almost acknowledge the whole functionist thing with it's complete opposite (or maybe absence is better) in this continuity. Anyway, I'm liking the way it's going, and have always accepted imperfection from my Transformers stories. If I have any real bug with the story, it's that REDACTED had to die for really no reason.